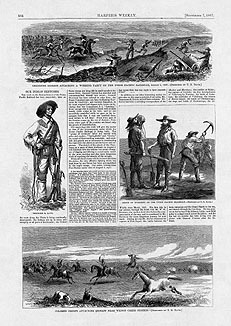 Harper's Weekly Magazine gave a lot of attention to the Plains Indians during the years immediately after the Civil War. 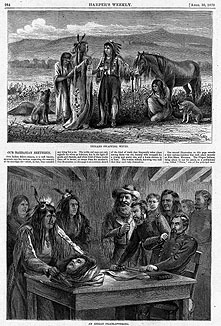 As you can read in the three articles directly below, the magazine's editorial discussion of the nation's policy toward the Native Americans took a relevatively balanced attitude, arguing for justice as well as firmness and acknowledging the role of white aggression and bad faith as a cause of Indian hostilities. 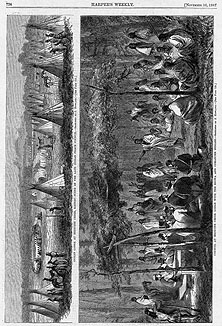 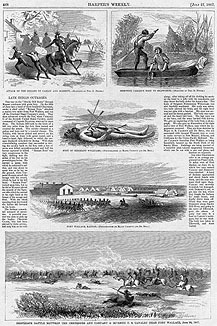 But Harper's Weekly was best-known for its illustrations, and during this period its visual representations of Indians are strikingly partisan, depicting the Indians as savage predators ruthlessly stalking and attacking white victims -- as you can see for yourself by enlarging the images below.